At about 34? 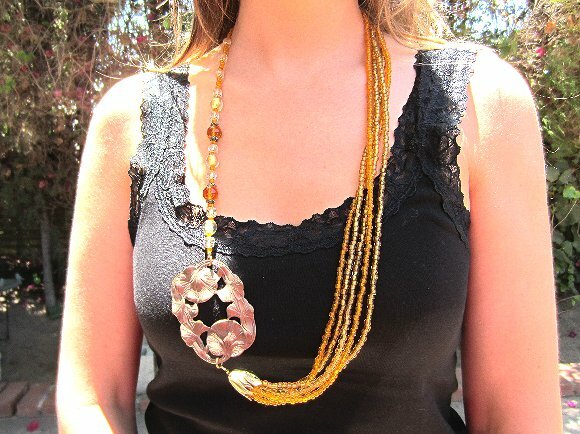 long, this asymmetrical hand beaded necklace is perfect to wear over scoop top tanks in warm weather, and with turtle or cowl neck top when the temperatures drop. The star of the show is the wonderful stamped brass gingko leaf focal. 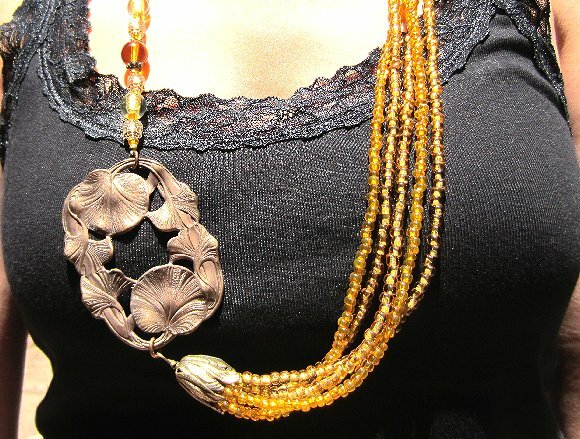 I?ve beaded the necklace so that the gingko leaf focal hangs to the side: very artsy, very trendy. 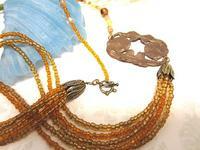 The shorter side of the strand twinkles and glows with vintage gold and topaz glass and crystal beads. The longer side is made with co-ordinating beads that I rescued from a broken necklace found at an estate sale. Absolutely unique, it?s another up-cycled beauty from Sparkle Plenty.